The Vivienne Westwood Dolce Vita Dome Bag is an architecturally shaped bag available in three colours, made from supple leather with contrast stitch detail. It is a zip top fastening bag with an oversized looped zip pull with orb branding, and this bag features the removable tassel key ring charm. The bag has two rolled leather top handles and also a separate, detachable and adjustable, cross body / shoulder strap for multiple carry options. All the metal hardware on the bag is gold coloured, including the Vivienne Westwood iconic signature orb which appears on the front. Inside, the bag is lined in a grey print fabric and there is a gold Vivienne Westwood brand plaque and a zip fastening pocket, together with further slip pockets. This beautifully shaped bag is perfect for the new season trend towards structured shapes. It’s such a pretty shape for a handbag, yet the style is both practical and spacious. I love the architectural styling, and also the deep diamond shaped leather bases to the handles. 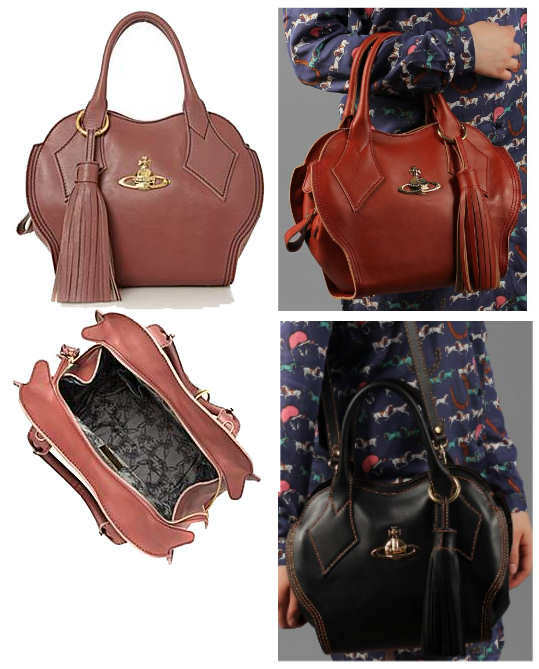 This is a bag you can enjoy for many seasons; your only decision: which colour? The new season Vivienne Westwood Dolce Vita Bag is a square bag made from buttersoft calfskin bag. 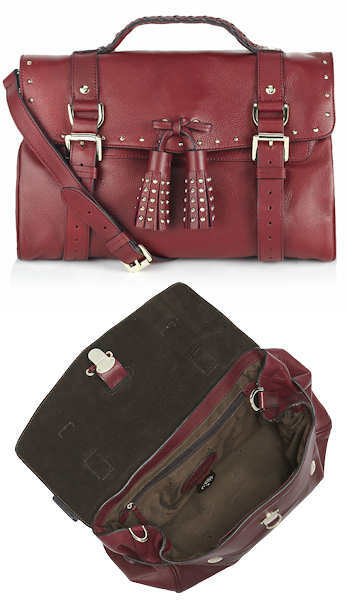 It is a purplish blue colour with contrast red stitching, and sports a slim, detachable shoulder/cross body strap strap. The bag is a flap over style with a concealed magnetic fastening, and there is a Vivienne Westwood golden orb plaque on the front. 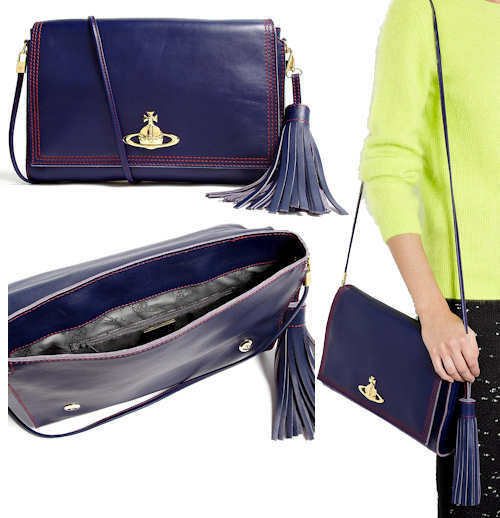 The bag has a luxurious tassel keyfob. Inside, the bag has a grey orb print lining, a zipped pocket and a slip pocket together with a Vivienne Westwood London brand plaque. This bag has a minimalist and sleek look which is ideal for the new season trend towards sleek shapdes. This bag can be worn across body, over the shoulder or remove the strap and it’s an oversized clutch, which makes it perfect for making the transition from day wear to evening wear. 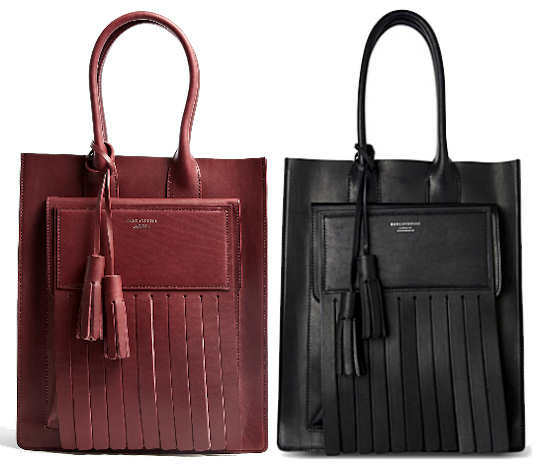 The Acne Piers Bag is a matte leather tote bag, rectangular in shape, with two rolled leather top handles and a removable double tassel handbag charm. The bag has an open top and a large flap pocket on the front, upon which the brand logo is embossed in silver. 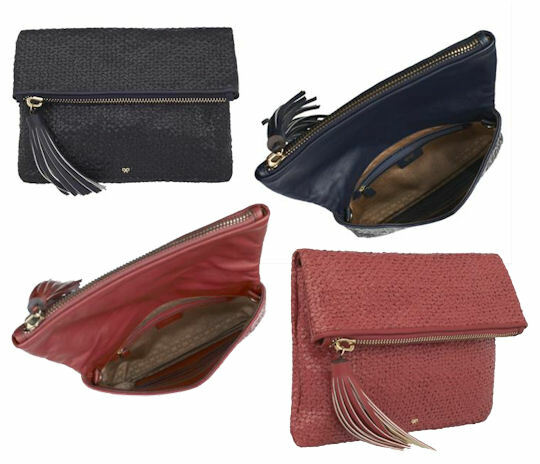 The pocket has a fringe trim and has a hidden magnetic fastening. Inside, the bag has a leather, zip fastening pocket which is embossed with silver branding. The Acne Piers Tote bag is fast becoming de rigeur for the fashion pack and it’s not difficult to see why. The style empitomises the Scandinavian cool of the Acne brand, with the fringe detail and sleek lines. And the bag is wonderfully spacious, for keeping everything you need for the day close to hand. UK based, my-wardrobe.com offer worldwide delivery; Selfridges deliver to the UK only. 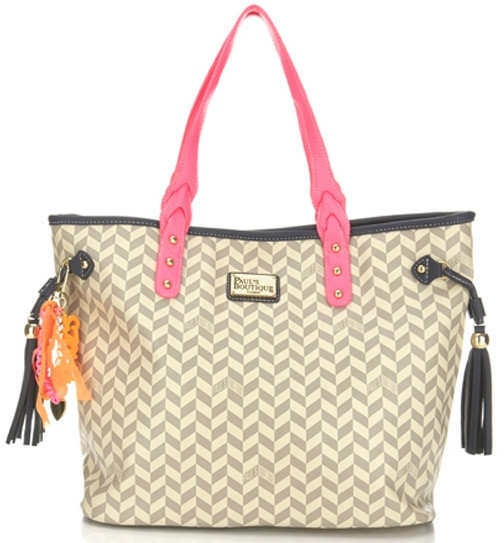 The Pauls Boutique Frankie Bag is a tote bag with an all over beige and grey chevron print. The bag has two bright pink top handles with gold tone studs to the bases of the handles, and there are black tassels to each side of the bag. The bag is a shopper style and features the signature Pauls Boutique brand plaque on the front. The Chevron print also features with Paul’s Boutique brand name in the print. The bag is embellished with a handbag charm, which is customised so it varies from bag to bag. Inside, the bag is fully lined in a bright pink chevron print fabric, and there are zip and slip pockets inside. The shopper fastens with a magnetic popper at the top of the bag. Measurements: height: 29cm / 11.3″; width 45cm /17.6″; depth 16cm / 6.3″; all measurements are approximate. Great for use as a day bag or a beach bag, Frankie is a great shopper which is large enough to carry everything you will need for the day. You can wipe it clean with a damp cloth and the faux leather material is really soft and nice. The Anya Hindmarch Gloria Tote is made from the softest calfskin leather. It is part of Anya Hindmarch’s newest collection of handbags – the Gloria collection, which has been release for the pre-Autumn season. 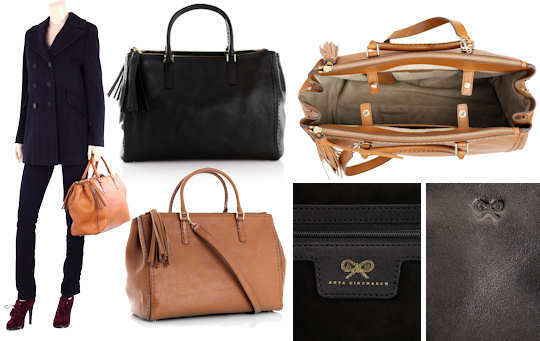 This is a large, three colour tote bag which has two top handles and a top zip fastening with a hidden tassel zip pull. There is a large external pocket with a branded enamel turnlock fastening on the front. Inside, the bag has lots of labelled pockets for your bits and pieces. It is fully lined in bow print fabric. Butter leather is a full grain calfskin leather which has been created exclusively for Anya Hindmarch by a leading French tannery. The leather is butter soft, with a waxy surface, known in France as the “caviar of leather”. In addition, the natural grain of the leather ensures that each bag is unique. This is one of the most expensive and high quality calfskin leathers in the world. The Gucci Marrakech Hobo Bag has a woven leather buckle adjusting shoulder straps and a top magnetic fastening. 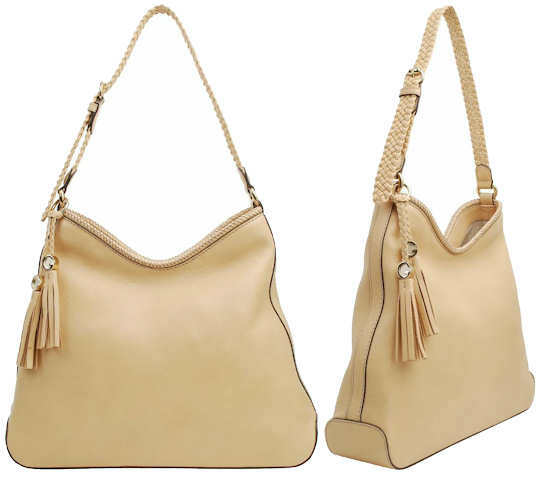 Made from beige coloured leather, the bag features two tassels with the G logo on plaited straps. All the metalwork on the bag is gold in colour. Inaide, the bag is fully lined and there is a zip fastening pocket together with a mobile phone pocket and a further slip pocket. 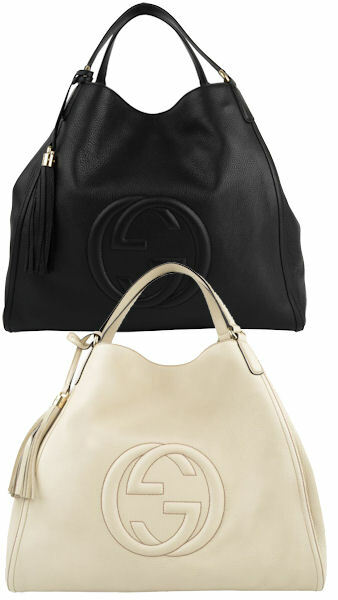 The Gucci Marrakech Hobo is a medium sized bag which is a classic style and reappears each season in different finishes. The bag is often made from the GG signature fabric, but this version bag is the most special because it is made entirely from leather – and let’s be honest, if you’re spending a lot of money on a handbag, it’s better to have one made from leather than it is fabric. This bag, in its ladylike beige colour, will go with absolutely anything and is a great investment purchase for the girl who favours classic style over seasonal trends.